Usu Nomi and Kinari Nomi are used to shave off small amount of material in joinery and are only pushed by hand. Never use a mallet and never leverage chunks. 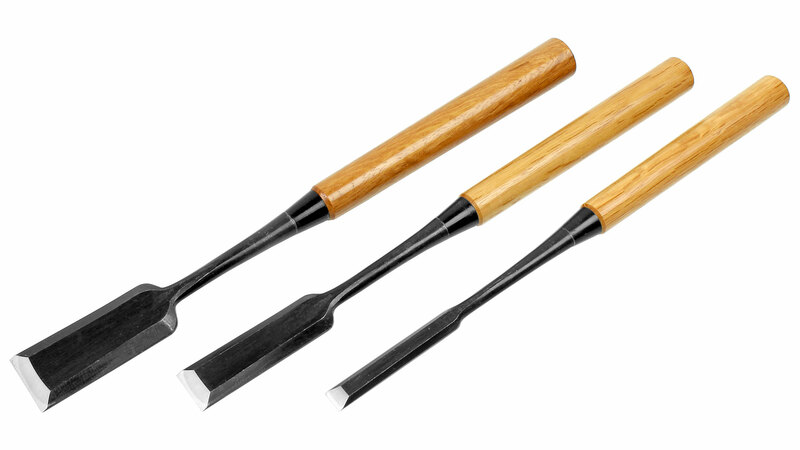 Japanese paring chisels are essentially made in the same way as Japanese chisels. The cutting edge is made of a hard steel which is forge welded to a softer stronger iron back. 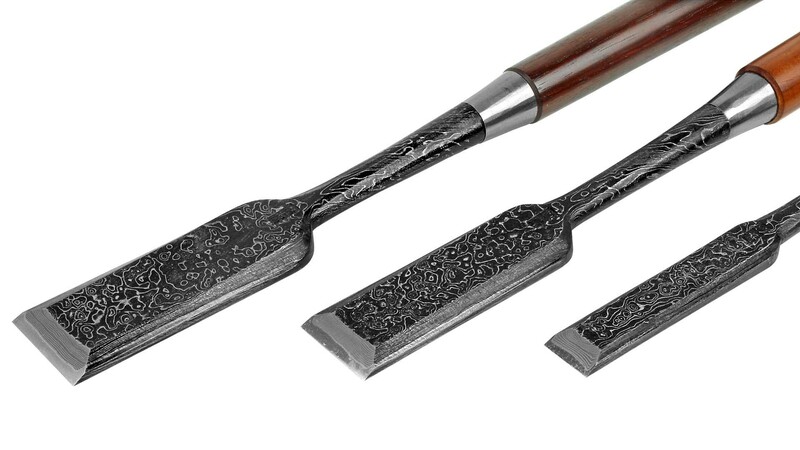 This method is grounded in tradition, and allows the use of very high quality steels in the smaller, artisanal, smithies which even today produce most high-quality Japanese chisels in their wide variety of forms and designs. 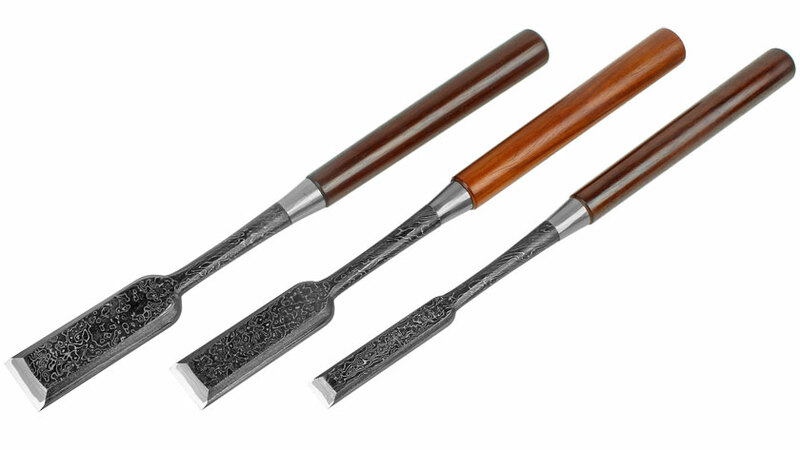 For ten years Fine Tools has been offering a very high quality line of chisels made by Master Matsumura with a cutting edge made of the finest "white paper steel" under the brand name Koshimitsu. So we are very happy to be able to add these fine paring chisels or "usu-nomi" which are made to the same extraordinary standard, to our store. 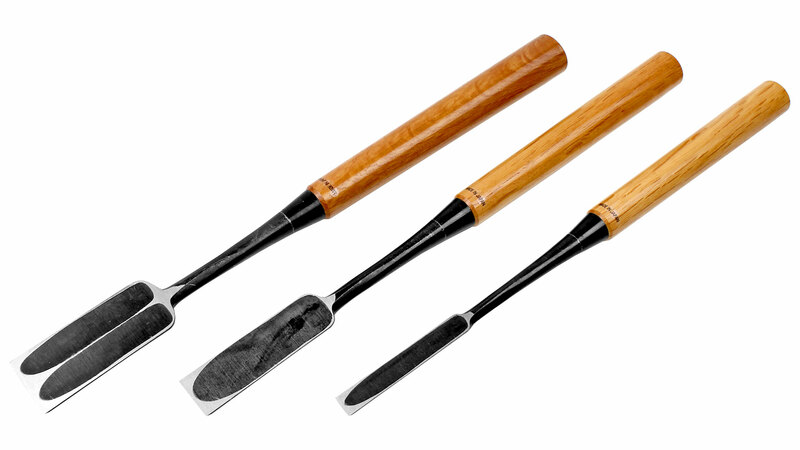 Like other Japanese chisels, these paring chisels feature a hollow back, which greatly reduces the effort and time needed to flatten and hone the chisel's back. 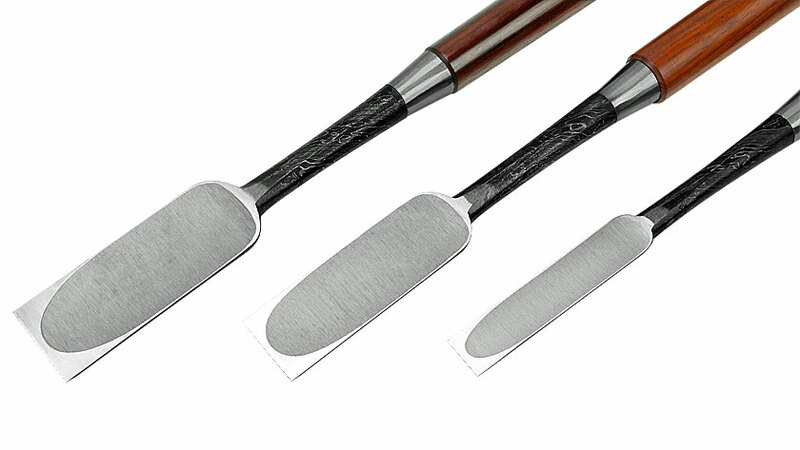 The "Tasai" Kinari Nomi are outstanding larger paring chisels. The "Mokume" pattern of the blade is a multi laminated steel with distinctive layered patterns. To increase the visible and perceptible contrast between the laminate layers a controlled corrosion process is used. The blades of these light, long, thin chisels are made of very hard "white paper steel". This steel allows the sharpest edge! They are used to shave off small amount of material in joinery and are only pushed by hand. Never use a mallet and never leverage chunks. The blades are about 3 - 4 mm thick at the end of the edge bevel and about 5 - 6 mm at the beginning of the shaft. The 6 -24 mm wide blades have a single scoop "Ura" on the mirror side and the 30 - 36 mm wide blades have a double scoop. They are crafted by Master Matsumura in Yoita City, Niigata Province, Japan under his brand "Koshimitsu"
Blade length 8.5 cm, working depths up to 15 cm are possible, because the shaft is slightly bent. 24 mm Currently not in stock! 36 mm Currently not in stock! Blade made of Suminagashi, the Japanese folded steel. The "Mokume" pattern is a multi laminated steel with distinctive layered patterns. To increase the visible and perceptible contrast between the laminate layers a controlled corrosion process is used. The core is made of Tasai Special Blue Steel, a custom made steel for Tasai. The handle is made of sandalwood. 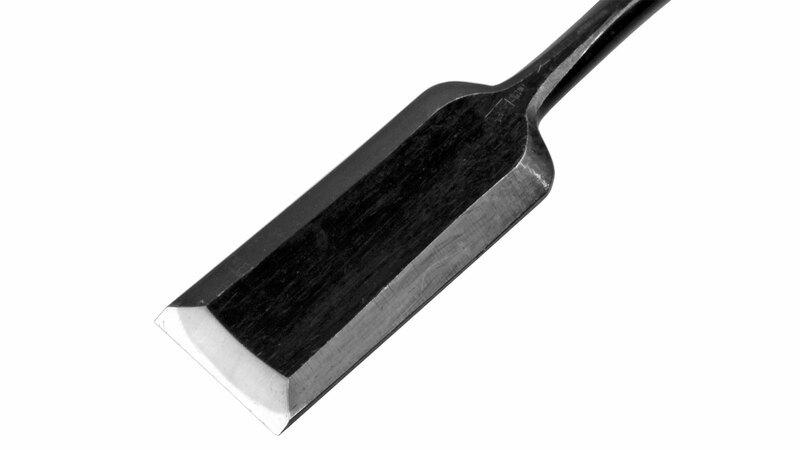 Blade bevelled at the sides and single scoop "Ura" on the mirror side. This type of chisels can easily replace smaller slicks. Made by Master Tasai in Sanjo, Province Niigata.